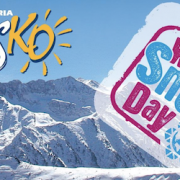 World Snow Day in Bansko comes around every year. And this time it’s held on Sunday 20th January 2019. Bansko ski resort celebrates the World Snow Day by reducing the daily ski pass to just BGN 1 for all children up to 12 years. Whilst I can recommend a trip to Bansko, unfortunately you won’t be the only one deciding to come to Bansko. So be prepared and follow my guide to avoiding lift queues in the notes of our live streaming lift queue cam on YouTube. The Bansko snow conditions are excellent now as you can see from the vlog above. On Sunday there will be some snow falling. Apart from the 1 leva child’s ski pass, Bansko visitors can expect a really nice and lively atmosphere up at Bunderishka Poliana, which is the area located at the top of the gondola lift. If you fancy an upscale lunch on the slopes, then be sure to book the VIP Room in the Bansko App because it’s usually fully booked. If you’re in town then book from a choice of twenty plus of Bansko’s restaurants in the Bansko Blog App. Bansko is more than just about skiing and snowboarding. It is a town with a long and fascinating history and a rich culinary tradition. The Bansko Cultural Tour is recommended or at least take a wander around the old town and the Church. If you’re after something different and a need get away from it feeling, then book a Skidoo Safari. Or if you have enjoyed your skiing and snowboarding and your legs are killing you, or just want to relax, then you need to head to the Recovery Lounge session. All these activities are bookable in the Bansko App. Whatever you get up to in Bansko, it is going to be a nice and lively weekend.